Bullis Charter School alumni, from left, Ninnad Raman, Maddie Young and Sophia Lufkin received “Highest Excellence” on their SchoolsNEXT project, which was a design for a school of the future. Bullis Charter School alumni Sophia Lufkin, Ninnad Raman and Maddie Young recently competed in the final round of the Council of Educational Facility Planners International’s SchoolsNEXT project and received “Highest Excellence” on their project. The Los Altos students designed a “school of the future” as part of Bullis Charter School’s spring eighth-grade Intersession, devoting three full weeks to an assigned study area. After winning the schoolwide, regional and national competitions, they competed in the international round in San Diego in October. The SchoolsNEXT Design Competition highlights the importance of well-planned, healthy, safe, sustainable and resilient schools. 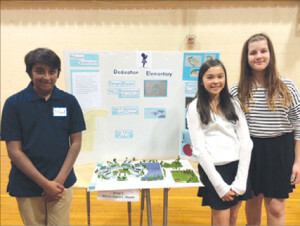 It invites middle schoolers to design learning environments that “enhance learning, conserve resources, are environmentally responsive and engage the surrounding community.” Students engage in the planning process for designing their schools from conception to completion and document each step of their project along the way. The project offered students an opportunity to apply their design-thinking skills. When creating their design, Lufkin, Raman and Young considered the school’s impact on the local community and the type of skills and spaces students of the future might require. In addition, they spoke with local architects to learn about design and planning, visited a zero-waste residence in Palo Alto to investigate how to apply such technology in a school setting and read articles about different types of schools and schooling. For more information on the SchoolsNEXT Project, visit cefpi.org.